Panel Built is the designer and manufacturer of our systems. We also offer a complete in-house installation service, and our crews specialize in assembling our product. Panel Built has a full time Install Manager who provides in-house coordination between our Install Team, customers and subcontractors. 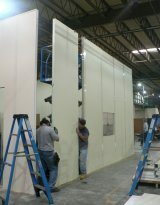 We employ twelve full time crew members who travel the country for Panel Built installs. We have completed projects internationally as well, with our team traveling as far as Guam and Angola to install large projects. Panel Built has an on-going in-house safety training program. Our Install Team is trained in OSHA Safety Guidelines, and fork truck and lift certified. All safety procedures on site are carefully adhered to. Our crews have completed numerous projects for government contractors and military bases, and are familiar with strict site access clearance guidelines. Panel Built operates through a Dealer-Distributor network, and it is the Dealer’s choice to either provide their own installers or use the service offered through our Install Department. Many of our Dealers take advantage of our professional installation service.